Don’t miss the GREATEST event of the year! Parents and friends, join us on Saturday, March 2 at the Loft on 8th Avenue for a night of chance, fun, celebration, and intrigue! The Annual Gala & Auction is our largest fundraiser and community event of the year. It’s a great way to connect with other Sunstone families while supporting your favorite school! This year guests will enjoy happy hour, games, a silent auction, dinner and a live auction while having fun and raising critical funds Under the Big Top! Oh, did we mention there’s dancing after? Don’t miss out! 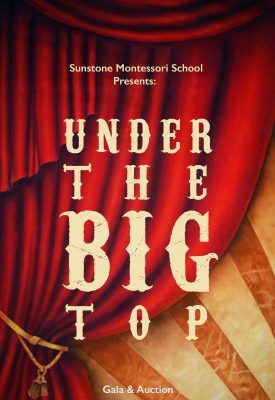 We are offering childcare at the event to enrolled Sunstone students and siblings (ages 3-12), so click below now to purchase your tickets and reserve childcare.